Republican leaders have put the bill, titled "The Federal Reserve Transparency Act of 2011," on the House "suspension" calendar. "Suspension" is a special fast-track process that protects the bill from amendments and extended debate, but also requires it to garner a 2/3 majority to clear the chamber. The bill needs 290 votes to pass. It has 274 cosponsors. Ninety-nine years ago, Congress created the Fed. 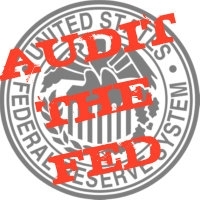 Today, for the first time, Congress will vote to (truly) audit the Fed. We've worked too hard and come too far to fall short at the goal line. Will you help us pick up the last 16 votes we need to pass "Audit the Fed" this afternoon? As of this hour, we've placed more than 1,500 calls to Congress. Help us get to 2,000 TODAY! TAKE ACTION: CALL CONGRESS TODAY & URGE A "YES" VOTE ON HR-459!